Very beautiful thanks for sharing. Beautiful perspective, angle and colors. I love how you caught the light. I concur…bella, beautiful and all of the above. I am amazed at the lighting and detail you were able to get within the dome. A technically incredible shot. YOu must have a very steady hand. Marvellous. 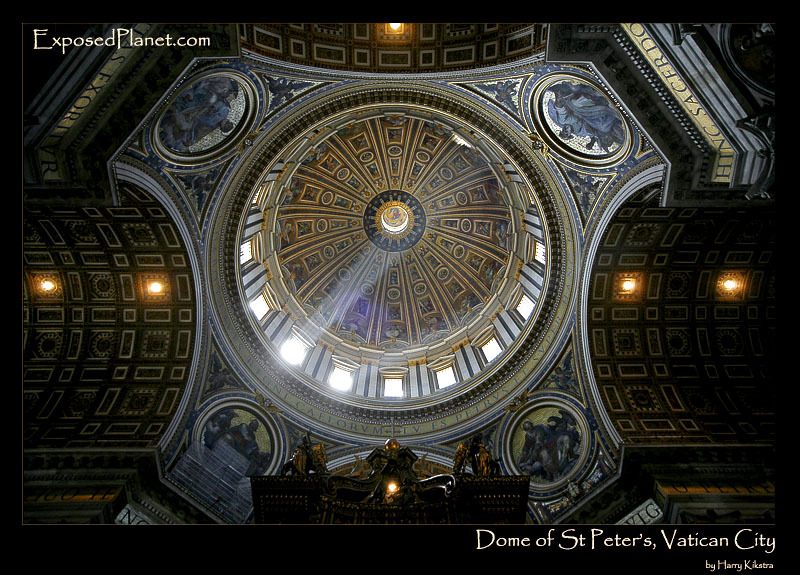 The story behind "St Peter’s cathedral dome in Rome, Italy"
One of the better results of the Christian accumulation of wealth was this magnificent piece of art, the San Pietro or St Peter’s Cathedral in the Vatican City, which itself is embedded in the city of Rome. Totally filled with priceless mosaics and sculptures, it is one big museum. This is what you see when you look up and see the light :) , the rays of the sun poking through the windows of the great dome of the cathedral.